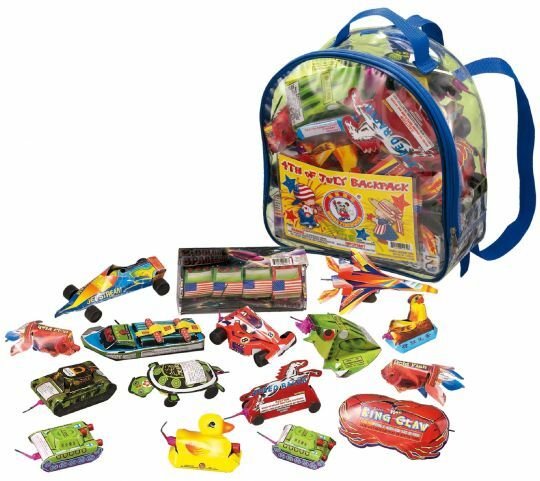 A fun assortment of assorted novelty items conveniently packed in a backpack. The pack includes a great selection of classic items like: tanks, hen laying egg, and even an aircraft carrier! A great collection of fountains and novelties that is perfect for a family-friendly fireworks celebration. It includes all the basics: sparklers, cuckoos, party poppers, snaps, and fountains. Killer Value has a little of everything: sparklers, fountains, roman candles, snap & pops, ground spinners, rockets, firecrackers & flashing signals. Two for the Show, is a small bag assortment with a little of everything: Fountains, Sparklers, Snappers, Roman Candles, a small Repeater, and some novelty items. 3 star due to the price value of the item, my wife loved it! Lots of small items , for little ones and not have to worry about blowing up !! I would buy this again !!! !